With the arrival of fresh bamboo material, the production of raw materials was immediately in process. The characteristics of the material and the versatility of it’s form was further explored. A general process peeling, cutting and splitting was followed.Participants were encouraged to be creative with newer designs. The main raw material used for the jewellery and small accessories were thin cut up strip. The general method of weaving was used in a lot of products.With more flexible material, more styles of weaving were explored. 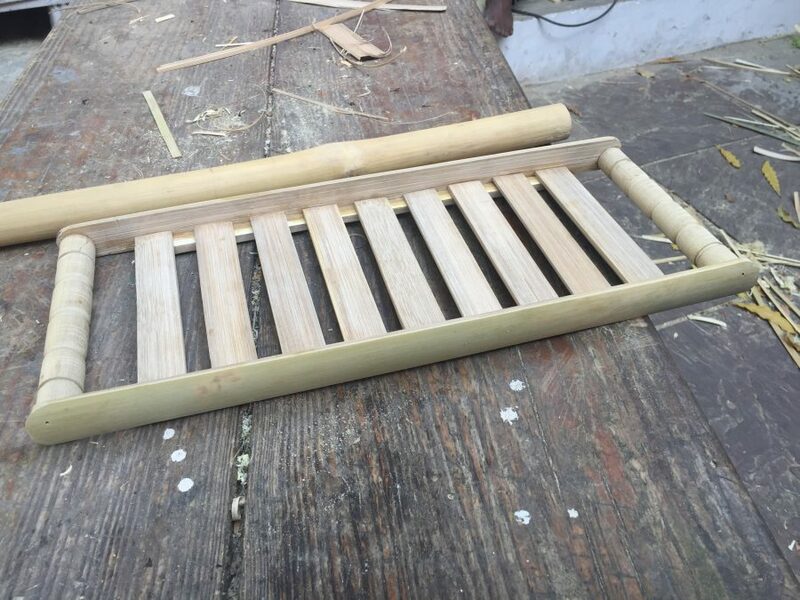 Furniture and accessories process: With fresh bamboo, structures for potential accessories were being explored, such as frames and structures for trays and hangers and candle stands.The form was being explored with sanding, cutting etc.Simultaneously raw materials like thin slabs (for tray) etc. were being produced.On the other hand the furniture structures were being prepped for glueing and finishing.